Just three weeks before a planned summit with North Korean leader Kim Jong Un, President Donald Trump is hosting South Korea’s President Moon Jae-in on Tuesday for talks as they work to assess whether North Korea’s commitment to rid itself of its nuclear program is genuine. Moon has long been a driving force behind the diplomacy between the United States and North Korea, and personally encouraged Trump to meet with Kim. In March, Moon sent special envoys to North Korea to encourage talks between Pyongyang and Washington. Last week, North Korea scrapped a series of follow up high-level talks with South Korea and threatened to cancel the upcoming Singapore summit between Trump and Kim in protest of the ongoing military drills between the United States and South Korea. The White House hasn’t indicated there will be a press conference between Trump and Moon, but this will be the first time the two are able to meet in person to discuss the status of the summit between Trump and Kim, and examine what options are on the table. 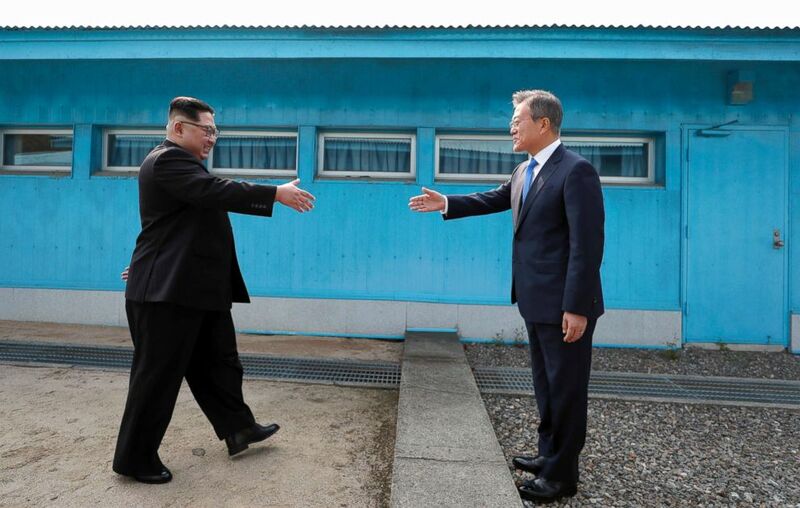 While the two have spoken over the phone, it will also be their first meeting in person to discuss Moon’s recent summit with Kim. While the surprise threat to cancel the meeting caught the president and the State Department off guard, White House press secretary Sarah Sanders said it was something the administration fully expected. Vice President Mike Pence said in an interview Monday that the administration is still open to the planned summit with Kim. The change in tone from North Korea last week went from that the all-smiles meetings between Kim and Secretary of State Mike Pompeo, to the regime’s chief negotiator Kim Kye Gwan issuing a statement saying he is “totally disappointed” by recent “extremely unjust” comments from U.S. officials and singling out the American demand that North Korea give up all its nuclear weapons before getting anything in return. “We -- we want to see the denuclearization process so completely underway that it’s irreversible,” national security adviser John Bolton said. The North Koreans have sent mixed messages on denuclearization of the Korean Peninsula. “... If the U.S. is trying to drive us into a corner to force our unilateral nuclear abandonment, we will no longer be interested in such dialogue and cannot but reconsider our proceeding to the DPRK-U.S. summit,” Kim Kye Gwan said in a statement last week. But while there have been some heated threats to pull out of the June 12 summit, North Korean officials have vowed to dismantle their nuclear testing facility in front of the media this week and appear to be moving forward with closing down the nuclear facility, which is the latest sign of goodwill in the Korean Peninsula. The North Koreans also seemed particularly upset by Bolton, who called on them to do what Libya did more than a decade ago. Bolton has repeatedly said that the administration plans to pursue "the Libya model," which calls for a strict monitoring and inspection plan to ensure North Korea has denuclearized. However, that comparison evoked the country’s descent into chaos following the deadly ouster of Prime Minister Muammar Gaddafi. Kim Kye Gwan directly criticized the model in a lengthy statement last week, accusing U.S. officials of "provoking" the country with "unbridled remarks." The president soon publicly undercut Bolton’s so-called Libya model comparison in remarks to reporters in the Oval Office last week.